Sirsa Shekim | Sirsa’s title track, Black Into My Life, releases May 27th! 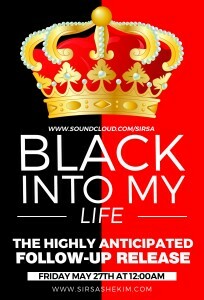 Sirsa’s title track, Black Into My Life, releases May 27th! Dear lovely friends, It was an exciting month last month, between all the amazing response to the first single “Shot of Your Love!” This month I release another song, and I am IN this music video! (Damn.) You get to see shy Ms. Sirsa on the screen (the directors and crew all knew that I had to down some shots of vodka to be able to film this video!) Ha! I’m going to release the song right here on the website, so please join back in on May 27th!!! PS this track was inspired by watching lots of James Bond movies and Hunger Game trilogy as well!